Does anyone know which artist painted this depiction of Christ? 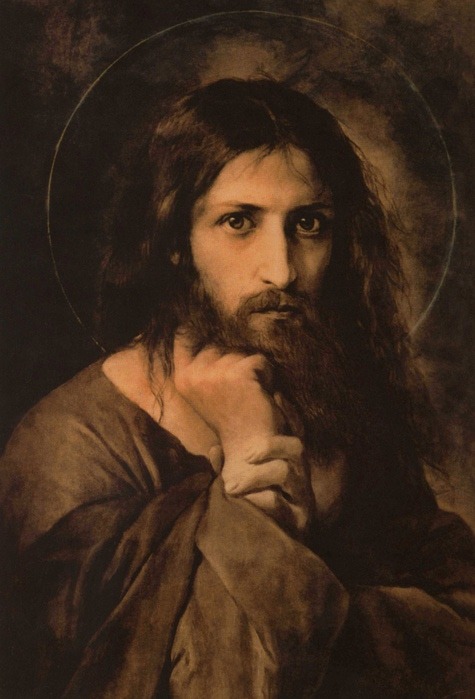 Topic: Does anyone know which artist painted this depiction of Christ? This is the first time I've tried to include a picture, so I'm not sure how this is going to work out. I am trying to find out which artist painted this depiction of Christ. I've seen it credited to Kramskoi, but cannot locate it among all his works. I've also seen it credited to El Greco, but it seems far different than his style. 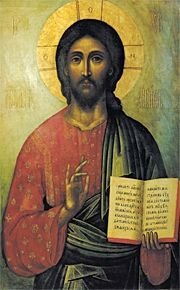 Re: Does anyone know which artist painted this depiction of Christ? It looks more like a Rembrandt to me. It's his style. Cue LBK screaming about how people shouldn't show Jesus doing something normal like leaning His head on His hand, 'cause doesn't everybody know you are not allowed to paint non-iconic religious art and they didn't even have the kindness to ask L first? Is that at all necessary? Yes it is. I'm tired of the idea that only certain people's opinions are acceptable on this site. Cut the hysterics, biro. Nobody here is calling that painting an icon, and I have never denigrated good, reverent religious art in any of my posts here. I could point out many threads where you did that at length, but I'm tired, and I want a drink. Wow! Truly...is that necessary? This forum is open to everyone, and everyone's "ideas" get equal time. The fact that some people actually know what they are talking about, leads to their opinions being more widely respected and sought after, in their areas of expertise. For icons, I would definitely look to LBK, who actually deals with icons on a daily basis, teaches about them, and publishes materials on them. For dogmatics, Father H, who actually teaches the subject. Work on developing an area of expertise, and we'll be looking to you for advice, as well. The forum is open to all!!! No it isn't. For instance, you just contradicted yourself with the last two sentences. I have to be an 'expert' on something before I can talk about it? I'm not allowed to say something unless it is 'advice'? So, only LBK *is* allowed to talk about it. I wasn't wrong, then. I never said only experts will be heard. I said experts will searched out for their expert advice. So, instead of whining about being heard....let's hear your opinion of who the painter is of the image in the OP. I think it looks like Rembrandt. I know it's probably not....but, to me it looks like it. Oy, oy, oy. It's nearly Lent already. Time for me to go sit in the giant plastic box from the Container Store. OK. I'm sure there's a really funny story behind that statement....but, I don't get it. It is apparently Karl Briullov. Once upon a time, there was a girl. And she lived in an apartment. And she had to move, so she cleaned up her stuff and put it in boxes. Which made her so tired, she got fed up, and sat in the last big plastic box. And that is why The Container Store is good. I searched for more paintings by Briullov, but, can't find the one I'm thinking of. Evidently you misread my post. It wouldn't be the first time. It's "Christ Tempted by Satan" by Georg Cornicelius. It was widely reproduced in Christ and the Fine Arts but I understand the original was destroyed. By my recollection Cornicelius was German. For other questions of this nature, you also have Google Image at your disposal. You can drag an image into the search bar and locate all similar or identical pictures online. Very helpful in determining names, artists, etc. For the record, I am not criticizing you for putting it here, just offering a useful tip that may assist you in the future (and offer quicker answers to your questions). Biro, if you are allowed to have opinions, then others are allowed to have opinions of your opinions, and you are allowed to have opinions of their opinions of your opinions, etc. This is provided that all are following forum rules. Provided the latter, all have an equal voice. Just because all have an equal right to express their opinions within these confines does not mean that all opinions are equal. Certainly you would agree that although all have an equal right to express their opinions, not all have equal opinions, much less do any of us have the right to ask that our opinions be weighed equally with others. We have an equal opportunity to express our opinions (again, within the confines of the rules of the forum), but equally each of us has the right to dismiss the opinions of some, and accept those of others. You have the right to completely dismiss LBK, me, Liza, or anyone. None of us wishes to in any way impede your self-expression on our opinions. But reciprocally, neither should you wish to impede ours, which you are doing by your insistance on pseudo-egalitarianism. Thank you. The painting is a fascinating study with the rework that inserts the halo, and removes satan from the background. I found the complete image, and my first impression is that I prefer the image without satan, but sometimes first impressions are wrong. What a pity to lose this in that evil war. Thank you for that, I was wondering if it was possible, but didn't know. And for wisdom, grace, humility, kindness, and artistic contributions- Liza! I didn't know you study iconography. Though this is not an icon, do you have a particular insight to this painting? Perhaps you've studied other religious art as well? I would be interested to read some analysis of it. While looking for the artist, I learned of Kramskoi, and saw his painting of Christ in the Desert and some critical analysis with historical and social context. It does not seem to be something useful for prayer, but only an intellectual musing, or attempt to convey the artist's own struggle with Christ, maybe. I have an icon of Christ on my iconostasis that was written by a Russian iconographer, and it is a bit more in the realism class, but is so serene. When I first started praying, I couldn't bear to have a stern looking icon of Christ. That feature changed my life. I have been looking for the original artist of this image also, so I was pleased so see it discussed here. Thanks especially to Keble, who had what I think is the correct answer to a really challenging question. What makes this such a puzzle is that the image originally posted by Velsigne is not its original form, which started out as an 1888 painting by the not-very-well-known German painter George Cornicelius (1825–1898) and entitled "Jesus wird vom Satan versucht" (Christ Tempted by Satan). I know very little German, so I can't tell you what the book says about the painting, but it does have the image below in the plates at the back of the book. If you look closely, you can see Cornicelius' faint signature in the bottom left hand corner. From these sources we gather that the painting was done in 1888, that it was 18 x 31 inches, and that in the early 1900s, it was in the collections of the "Konigliche Nationalgalerie zu Berlin," or Berlin National Gallery. I think this corresponds to what is known as the Alte Nationalgalerie in Berlin today. So far, I do not know of any later mention than Bailey's 1917 book. The Nationalgalerie was heavily damaged by bombing in WWII, and it is possible that the original painting was destroyed. Also, when WWII ended, most of the surviving artwork was confiscated and went to different Allied countries while Berlin was being reconstructed. If anybody has any further information about the original, I hope they will share it. So far, the story of this painting is tragic but not uncommon; here is where it gets a little weird. At some point, another version of this image began circulating, this one without Satan in the background tempting Jesus with a crown and with a halo added to the image. The painter's signature has also been removed. This is the image as posted by Velsigne. If you put the two images side by side, you can see that they are ultimately from the same original. The unaltered image, if it is not cropped and still bears the signature, is difficult in good conscience to attribute to anybody but Cornicelius. It is the altered image, which has been modified to make it more suitable for devotional purposes, that has been misattributed to various painters. Rembrandt and El Greco have been suggested, but these are easy to dismiss by looking more closely at the styles of those painters. The two false attributions that are the most persistent are Karl Bryullov (1799-1852) and Ivan Kramskoi (1837-1887). There are a number of websites (mostly Russian) that attribute the altered version of this image to either Bryullov or Kramskoi. I personally like the altered image better for my own purposes, but I cannot help but wonder about the fate of the original painting. I think this image is actually an iconic self-portrait by Rasputin. I've tried to use google translate with the German wiki source, but it is barely intelligible. This is one of the few pieces of art that makes me wonder about the artist, his choices, where his art stood in the artistic milieu of his day. After Keble posted who the artist is, I found the original with the darkness behind the image of Christ. I agree that the style is very different from the usual suspects credited for this painting, especially Kramskoi, whose image of the Temptation of Christ is strikingly different not only in style, but content as well. When I look at them side by side in your post, to me the expressions on the face of Christ appear different. It's very strange. Does it appear that way to you? I also wonder about the placement of the hands. Why are they positioned just so? The details are fascinating; I would like to know what the artist was thinking. At first I didn't like seeing the original after only seeing the shopped image. Now that I revisit it after your post, I see it differently. It's actually sort of inspiring. "...This latter comes especially to advantage by having its roots in his frankness of intuition and perception and a strong individuality in religious and historical themes unsought trouble in nature and awakens the Inside and the specifischen content of the dramatic firmly banned substances with sharp idea for a new, lasting existence. This mental effect raise the formal investiture of his works, the embarrassment and self-controlling step in the peace Ausfführung technical and design. In his Nekrologist says Winkler, who has closely followed his work persönilch to the goals: "That. . . the color is the medium of his thoughts, which must be seen in his paintings themselves. . . The harmonious harmony of form and color of plastic Modellirung and picturesque apparency is treated with a sovereign skill. . . . If the artist thereby achieved effects deep, saturated, gold-lit tones as we admire at old pictures, then the-earned Good, artistic result. "The Bildnißkunst now was still vigorously maintained special area of ​​C., for which except Hanau particularly Frankfort- . M. a varied number of copies apparent uniqueness and depression presents: mannichfaltige a series of private provision of services whose ultimate purpose wander anywhere on the observation differenzirende can neglect the power of the characteristic. His reputation as a portraitist localer is tight today, while the free children of his imagination have won him the judgment of art connoisseurs and art researchers an unassailable items. The so-called "modern" compared to it was free and not very friendly, he also liked a genuine, honest, serene realism often and again, in the "genre" with humor, have borrowed and paid homage to his very best...."
I have not found anything about Cornecelius on the internet except what you posted. My search engines just want to give results for 'Cornelius'. The painting could be anywhere. It could be rotting away in someone's attic, in a private collection somewhere, or long ago destroyed. I've heard of paintings turning up years later after being stowed away when the Nazis came to power. Perhaps it will turn up again someday.